BOZEMAN SEWER MUTANTS: Red Bull Bracket Reel Orientation from Alex D'Agostino on Vimeo. 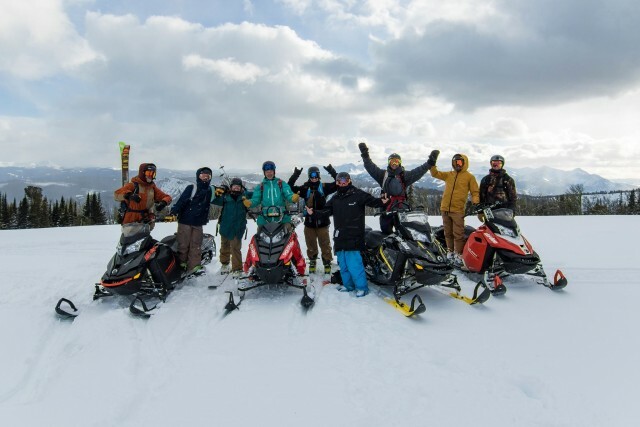 Riding up to Bridger Bowl on horseback, skis over his shoulder and a girl pouring Redbull into his mouth, Jake Wenzel might be the best marketing guy the energy drink company has ever had. He’s the “Stoke Master” of the Bozeman Sewer Mutants, a crew competing in RedBull Bracket Reel, the most entertaining, elimination-style competition in March (sorry, basketball fans). Bracket Reel invites 16 college crews to put together weekly two-minute edits, in a bid to win a ski trip—location is winners’ choice, within reason—with the whole crew. The single-elimination, bracketed competition pits teams like University of Vermont’s Ski and Snowboard Club against Oregon State’s C.ore Freeride. The most formidable competition in this years’ competition? The aforementioned Sewer Mutants. The Bozeman Sewer Mutants // NIGHT from Alex D'Agostino on Vimeo. From flipping over a raging bonfire and a broken down car to ripping bumps in glacier glasses, the Bridger boys are bringing style, humor, and serious skiing to the table, all in well-shot, cleanly edited videos put together by Alex D’Agostino and Jake Lamons. However, they’re not the only team of note. The University of Washington’s Husky Snow Squad did some creative urban riding—especially considering Seattle hasn’t seen snow nearly all winter—and C.ore Freeride’s night setup, complete with bonfire, pals, and rooftop jibbing, is enviable to say the least. Last week determined the final four, with edits filmed entirely at night. Now, crews from Oregon, Washington, Colorado, and, of course, Montana battle for a spot in the final two. Voting for the next round begins Monday, March 7. Support your favorite teams here. The Mutants, on a top-secret mission to get the shot.